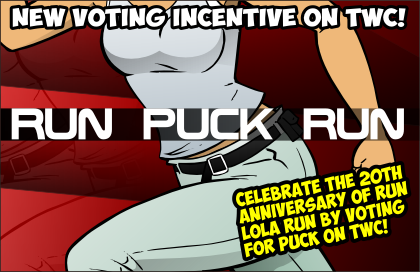 NEW VOTING INCENTIVE! RUN PUCK RUN! Twenty years ago, some crazy foreign movie about a spitfire redhead and her super-stupid boyfriend came out. A few weeks later, the comic strip Puck began. Coincidence? I think not. Anyway, if you’ve seen Run Lola Run, go vote to see my weird homage. And if you haven’t, uhm … vote anyway? VOTE FOR PUCK TO DEFEAT THE ARMY OF BOTS!!! Daphne has never been drawn without her pigtails. Ever. At least since comic #81, and before that, she was only ever shown in a baseball cap. So this is the first time ever that we have seen her hair unleashed. wow daphne has beautiful hair. ‘Beautiful’ is one word for it. Nothing wrong with an aerobics instructor (once they come of age). It’s time to stop trying to make a bridge out of butter! Well, hate to disappoint you, but it won’t be staying like this. It’s ok, the 1980s didn’t stay either. I was in my 20s and that hair may have too many happy, happy memories!! Yeah, loads of volume, thick, healthy. The proper stylist could transform this to Dynamite !! Well, the next few strips will be devoted to exactly that. She won’t end up blonde. That much I can say. Devilgirls rush in where Pucks fear to tread…. That’s a great tag, really. That’s not a real place. Olivia Newton John is suddenly playing somewhere. … are we talking “Xanadu”, “Grease”, or her “Let’s Get Physical”-video …? I want it noted that I wrote Phoebe’s closing line for this comic, and only afterwards did I look up when ‘Physical’ was released. The answer? 1981. Because of course it came out in 1981. This is me when I let my hair get long. Natural fro, not my best look. Some can pull it off. Most can’t. The horror!!! Worst hairdo ever! I’m on the same page as you. Though apparently lots of people like this look, judging from the comments. My human pet, “Baldie”, tells me he wishes more of the women he dated (1000 years ago, I think) had hair like Daphne’s. He talked a good game, but when they brushed away their hair and got a good look at his mug it was EEK SCREAM RUN WAY. I have no idea how he eventually corralled Janet. Did I evah tell you he has MISMATCHED EARS ? Oh, both are very normal in appearance. They are just from DIFFERENT PEOPLE !! XD Daphne’s inner woman has more fluffy poodle in her than I was expecting! 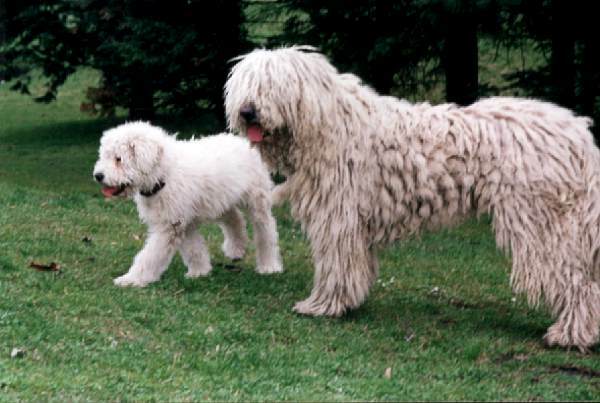 I think it’s more schnoodle than poodle, but you’re on the right track. Well, there is that possibility. Phoebe needs to learn to listen to Puck when it comes to Daphne; she’s been taking care of her since she was a child, after all, and since well before they all wound up living in the same house. No one ever listens to Puck. It’s what happens when you’re right. Lots of body and volume, wavy… I could work with that. I’m thinking an asymmetrical style, a little leave in conditioner for shine and management, maybe some for her fur, too, with some gloss for her lips and mascara with liner to make her eyes pop and you’ve got a great look that is simple and easy to accomplish. Give her a full length gown, I’m thinking mermaid, and teach her to walk in heels and she’s gonna have Taylor/Tyler eating out of her hand. Um… she does know how to dance, right? A) You’ve been thinking WAY too much about this. B) No, she does not know how to dance. Actually, that was just off the top of my head. I have a knack for this. This might be why my fiance says I’m so metro, I’m one KiKi from outright flaming. All Daphne needs to do is watch this video, and she’ll be good to go. Dancing is just like life: It all begins in the hips, and you have to have rhythm. It took me a while to get that. I was actually curious what she’d look like without pigtails. Now I know. Not… What I expected. Now let’s hope that this comment works… (My comments haven’t worked for the past 2 weeks and I have no idea why). Well, the hair won’t stay like this for long. It’s transformation time! Actually, I think her hair looks nice. Yea, she could do something to keep her eyes clear, but otherwise her hair is nice. You seem to not be alone on that front. I hate to disappoint you, but it’s going to get changed real soon. Meh, whatever. I’m not expecting anything permanent. I’m more curious how you’ll wrap this story up. I like crazy hair. I think I spend most of my life drawing it. Crazy hair has its place. It’s not really in vogue right now, but I do appreciate it. Okay, there is what can be worked with here . . . This is workable. It really is. Perhaps Phoebe can consult her inner stylist. Or maybe an outer one. Definitely inner. This is no job for professionals. This is a job for WELL-MEANING AMATEURS!!! Thinking like that gets people in the morgue more often than not. Well, if we’re talking household wiring, maybe. If we’re talking hair, there’s a slightly lower chance of death. But only slightly. Eh, I think it’s cute. Hope Phoebe doesn’t spoil it TOO much. It’ll be different. Not spoiled. Just different. Does the hair have a Quebec accent? Note that I just got back from a vacation in la belle province, and I think I was channeling that. Oh that was so cute…gonna make me Die of Cuteness poisoning. Didn’t know that cuteness poisoning was a thing, but hey, as the toxicologists say, everything’s got an LD50. 1981 and Aerobics instructors. Can you say “20-Minute Workout on CITY-TV”? You just sent me to Youtube for a cringey dive into cringe town. I do miss that City TV guy’s voice: so deep and cool. “THIS is City TV … Everywhere.” So cool. Why has nobody said anything about her shirt? What the heck is a Mumen rider? Ref to an anime. One Punch Man. She’s worn the Mumen rider shirt before… or has been wearing it so long it seems like she’s worn it before. All of the events of the past bunch of comics have been happening on the same day. So yeah, she’s still wearing the same shirt. To be fair (ow – it hurts to be nice), Daphne most likely is in the upper 25% of her female classmates when it comes to having a nice figure. I think THIS would work for Daphne. Not a lot of skin, no one would even know she was wearing Sneakers. Her hair is almost right for the look, too. I doubt she’d have the confidence to pull off such an iconoclastic look. Her iconoclasts are barely showing at all ! EG’s bot doesn’t like me. It was the word ‘sneakers’ that tripped it up. I’ve flagged that word because SO many spam ads selling that stuff pop up in my feed. But it’s back now. As she’s noted before, though, she doesn’t do her own enforcing. She contracts the violent part out usually. So watch out … when you least expect it.